busted, part one | Flickr - Photo Sharing! our garden plan from THREE years ago. Ha! a way-too-tall-to-be-climbing-on stool. I think we need helmets. hee! I love them! Thank you for her sushi pants!! dep, Wendy Cook, The Feminist Mafia, and 4 other people added this photo to their favorites. oh my god. what a little sneaky one!! i love the look on her face. how adorable and independent of her! i gotta get sam up to speed. I love how she's all, "What? I do this all the time." 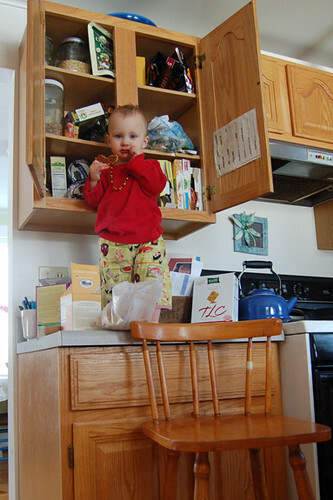 this reminds me of when my sister was little - we had to keep all of the kitchen chairs/stools ON the kitchen table so she wouldn't climb on everything... except one day someone left one down and my mom found her 10month old baby standing on a chair on top of the table! My little girl do the same. awesome! i am so glad you got the camera before dismantling the situation! What a S T I N K E R! Oh My Goodness! I would have had a stroke from fear over possible injury! What a look on her face!!!! ahh! I did the exact same thing when I was around the same age, only it was to get a glass bottle of grape juice, which I dropped and then fell onto and cut my whole hand open. I still have a huge scar. Sneaky sneaky tots!